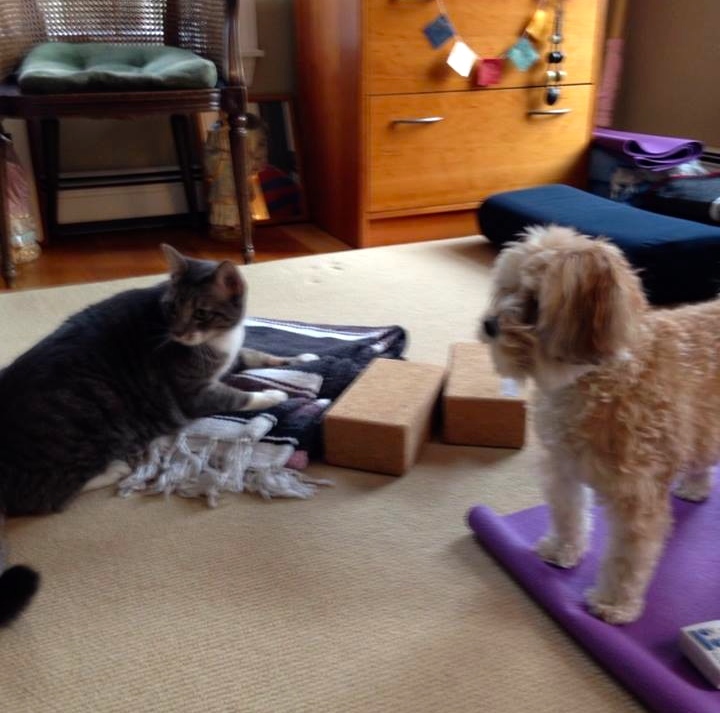 Kids Love Yoga…and so do pets! 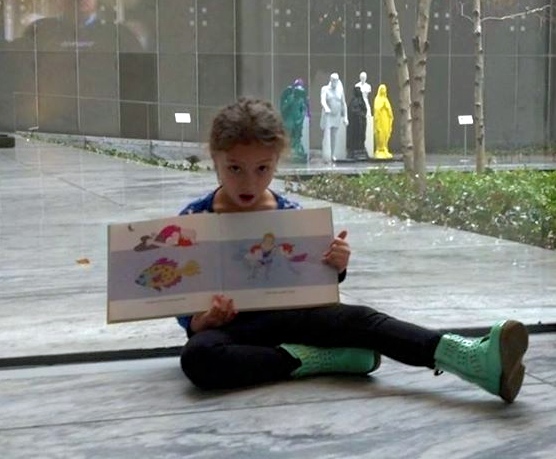 Serafina Raggaza Sciorra won’t even let this go at the Magritte exhibit! Later, at home, Serafina teaching her sister Katyana and brother Enrico. 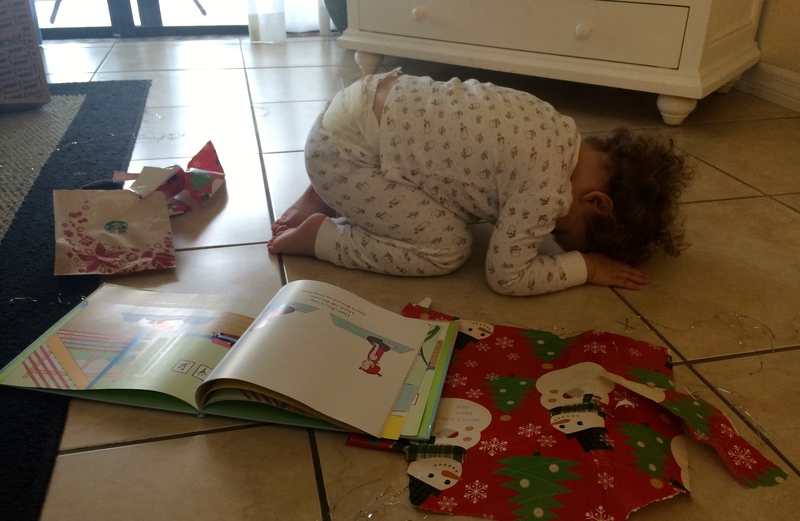 On Christmas morning, 2 year old Grayleigh Smith from Boston unwrapped her gift, Watch Me Do Yoga, and immediately started her yoga practice. This is Adho Mukha Virasana (Downward Facing Hero Pose). 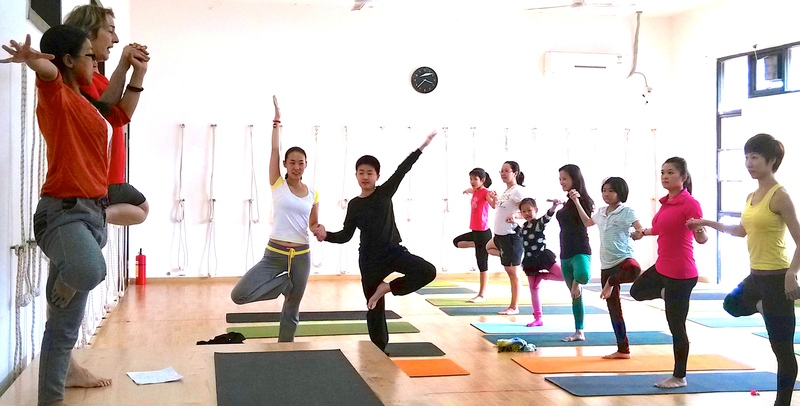 Candice, preparing for Parsvottanasana (Extended Side-Stretch Pose), at the Parent & Kid Yoga class, the Iyengar Yoga Institute of China, Guangzhou. 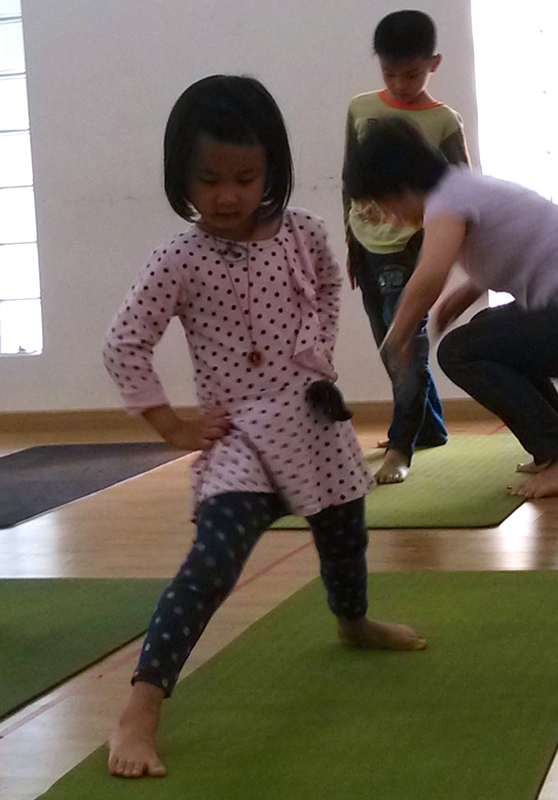 Careful placement of feet as a preparation for Utthita Trikonasana (Extended Triangle Pose). 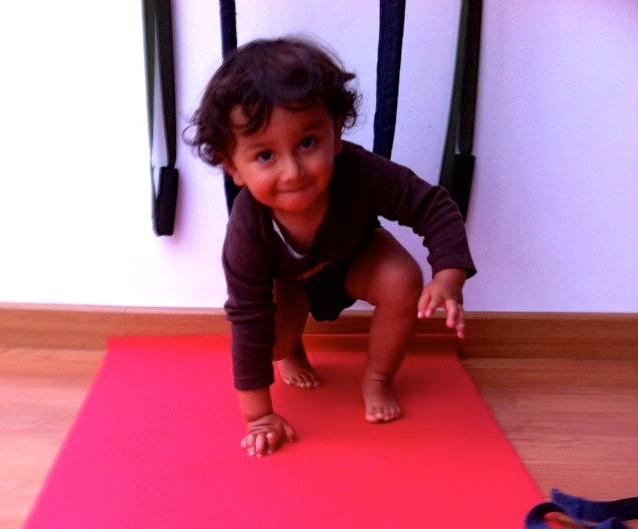 Anna Uribe’s little boy, Martin (at Natural Yoga in Bogota, Columbia) preparing for Virabhadrasana I (Warrior Pose I). 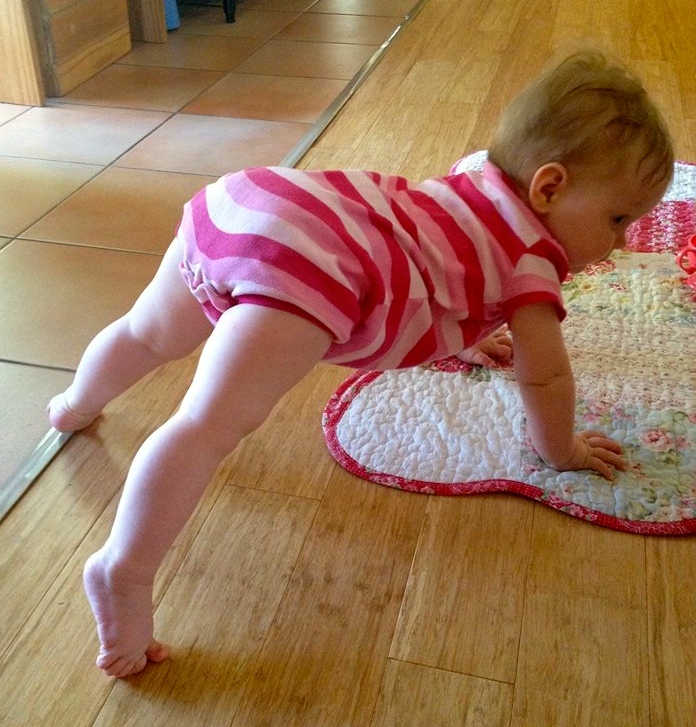 Seven-month-old Olivia, in Brisbane, Australia, practices an impromtu Adho Mukha Svanasana (Downward Facing Dog Pose). 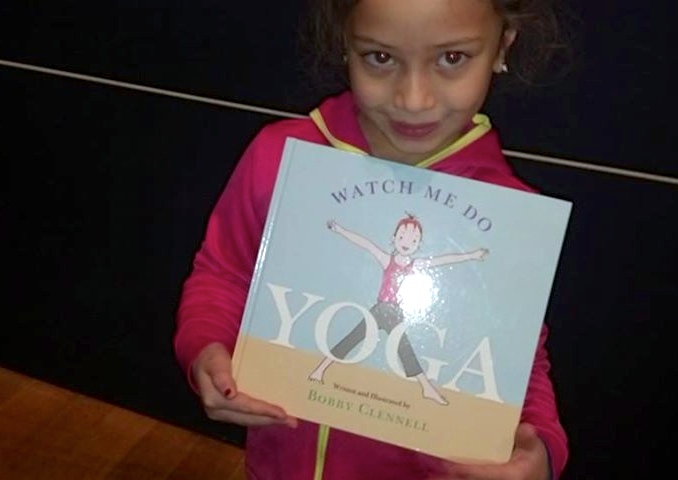 She’s the granddaughter of Narelle Carter–Quinlan, a certified Iyengar Yoga teacher. 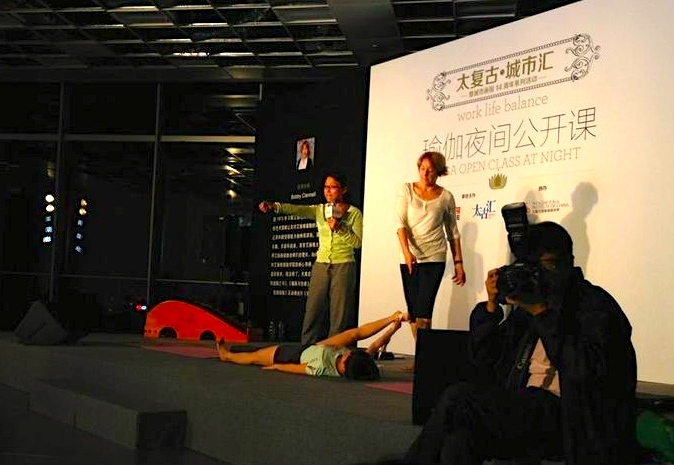 Narelle, an anatomist by accademic training, specializes in yoga for scoliosis. “Come on! The props are out — let’s practice!” Photo of Cecil, her cat and Peaches her dog © by Judi Lanszberg Friedman. 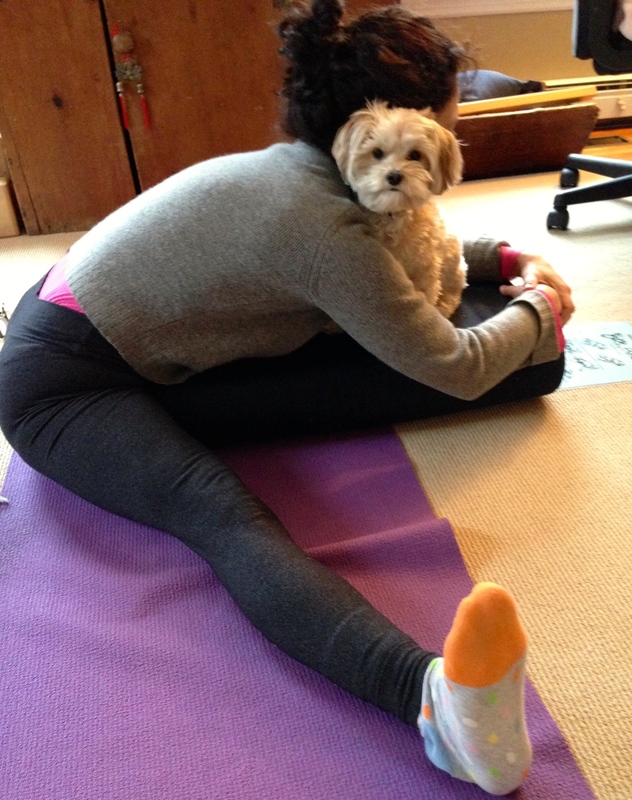 Judi Landzberg Friedman and her dog Peaches from Bedford Corners, New York, practicing Parsva Upavistha Konasana (Seated Wide-Angle Sidebend Pose). 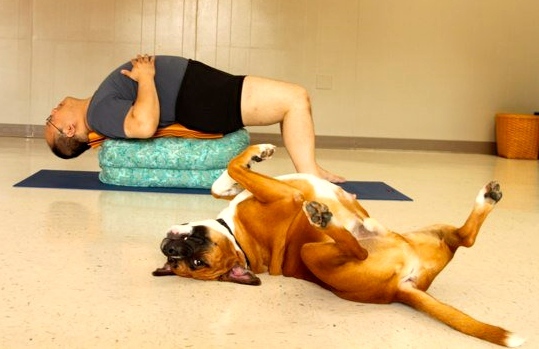 Jarvis Chen and a dog called Boo practicing Viparita Dandasana (Inverted Staff Pose). Jarvis is practicing a supported variation. Boo’s pose is combined with a slight twist and is independent of props. 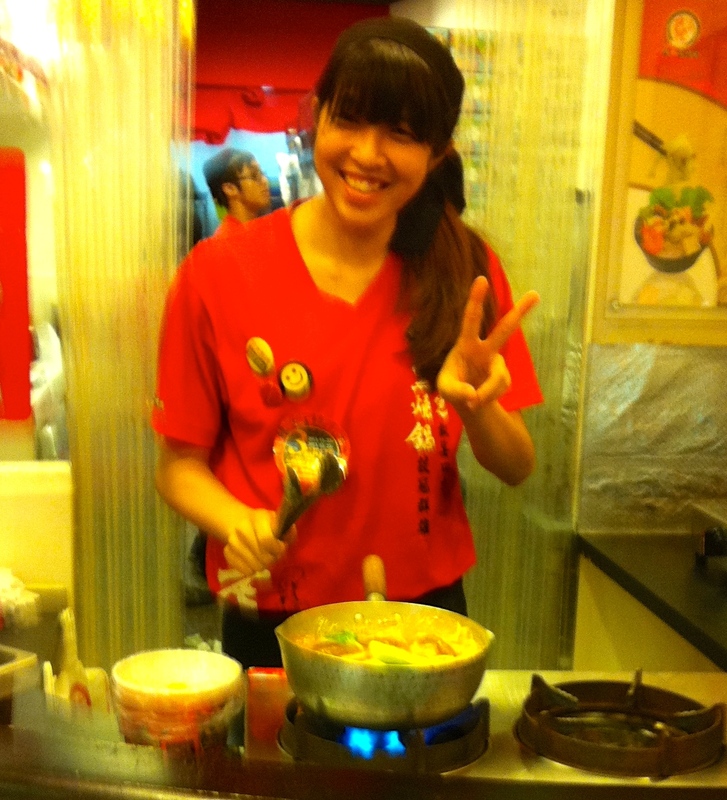 My dinner is almost ready. Food cooked on the street always tastes so good. For pregnancy, practice Ardha Chandrasana (Half Moon Pose) with support. Avoid having the lumbar spine pressing into the abdomen by aligning the feet with the pelvis; place them in front of the trestle. 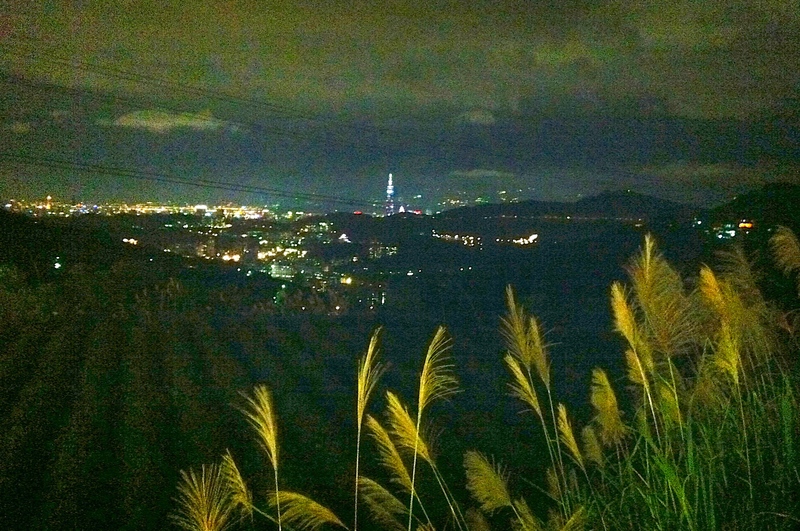 On my last night in Taipei my host, Shelly and her husband took me out to eat at a place high up in the hills. The tallest building in the world (at least, until recently) can be seen clearly in this picture. Nearly home! Stopover at Incheon International airport, Seoul, South Korea. 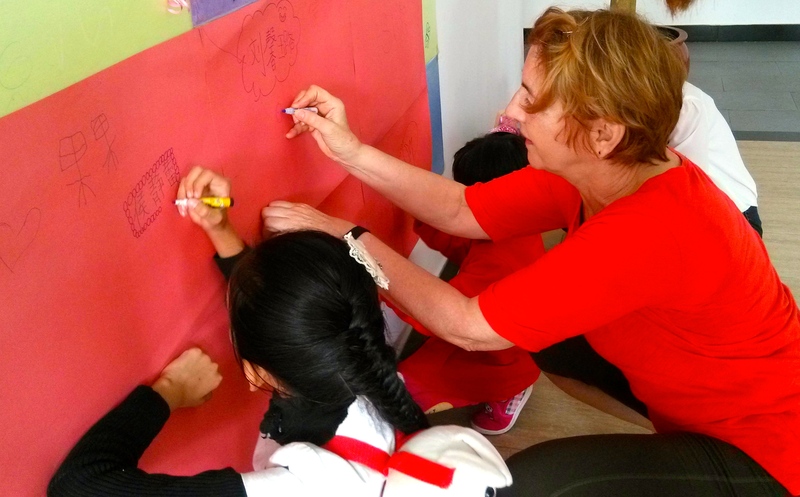 Drawing with kids while waiting for the class to start. Adho Mukha Vriksasana (Tree Pose) with Mom. 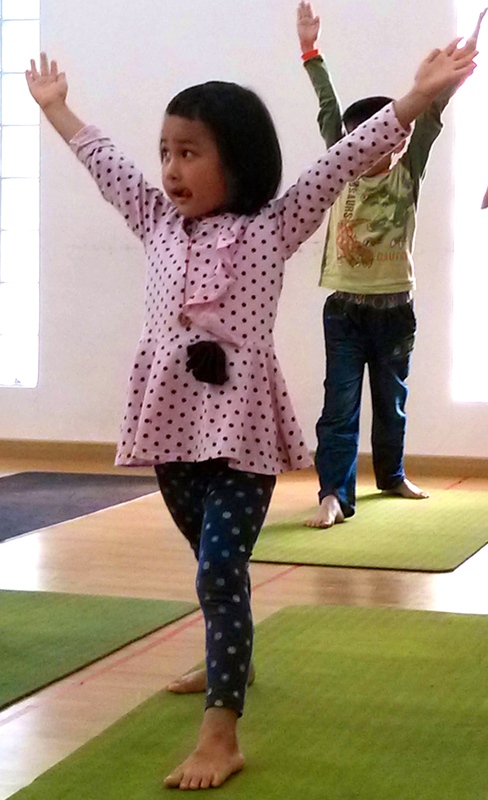 Adho Mukha Vriksasana (Tree Pose). Now we’re on our own! Supta Sukhasana (Reclining Cross Legs Pose). 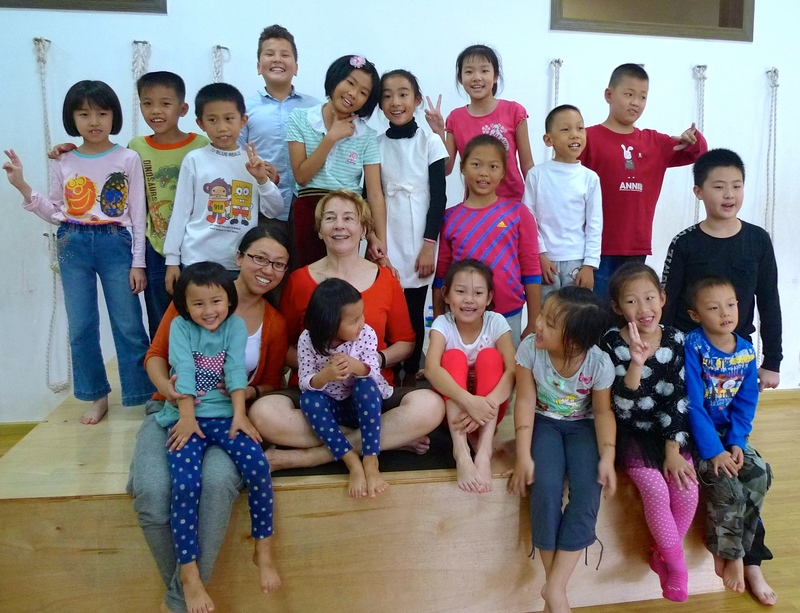 After the clas with the children. 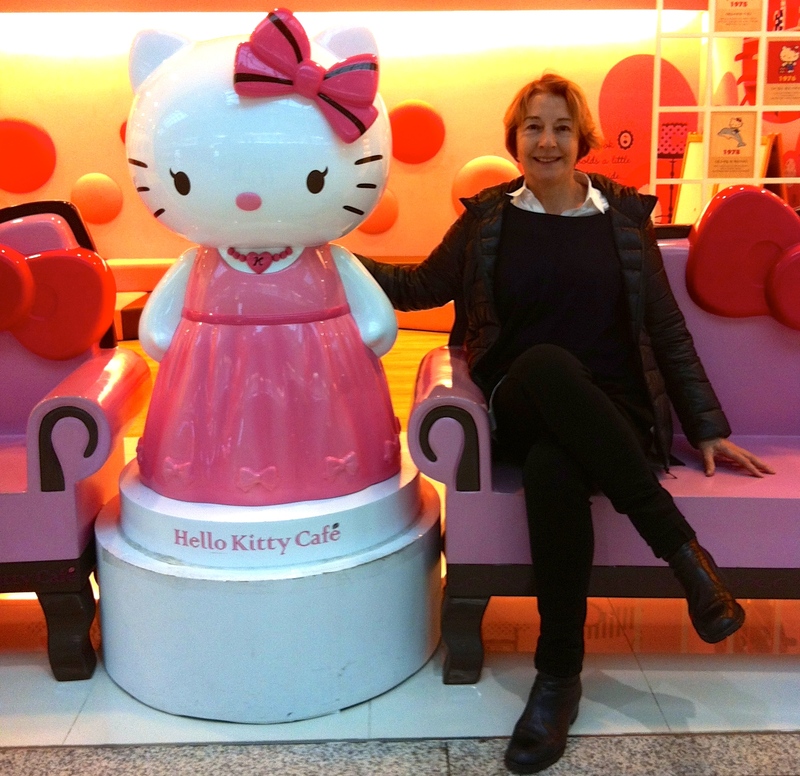 My translator Ming is next to me on the left. 3-day women’s class. Spreading the palms of the hands and extending through the tips of the fingers in rope Adho Mukha Svanasa (Supported Downward Dog Pose). Hands are an important part of our practice as women; they influence the chest. 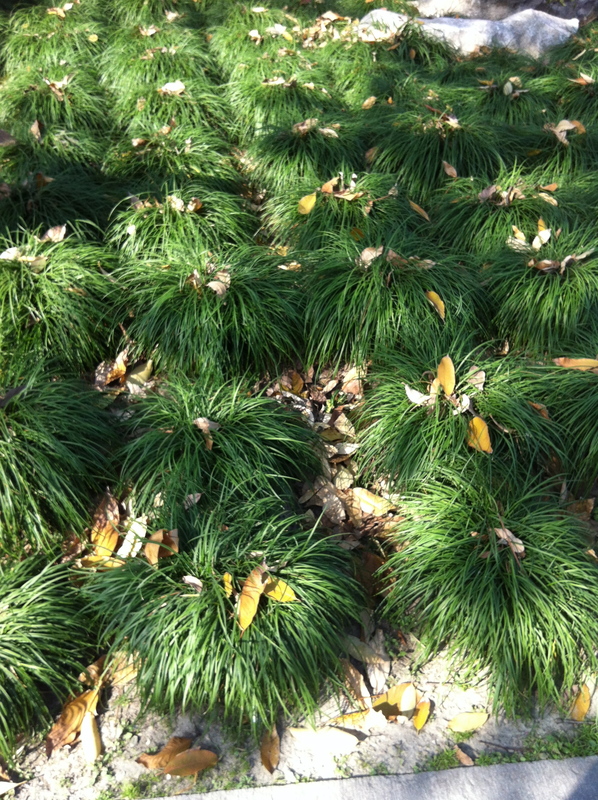 Spread the palms and the circulation is immediately improved around the breasts. 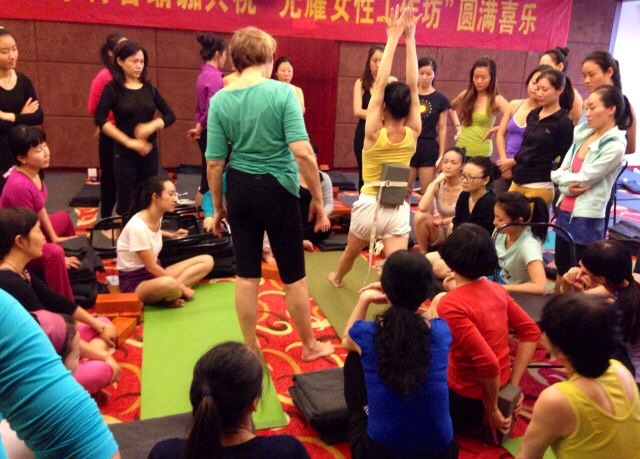 200 women came for a 2 hour class, 40 floors up, in the tallest shopping mall in Guangzhou. They were mostly office workers from the area. Suptha Padangustasana II (Reclining Big Toe Pose to the Side). There was a lot of media excitement. I think I was interviewed at least five times before the class began. 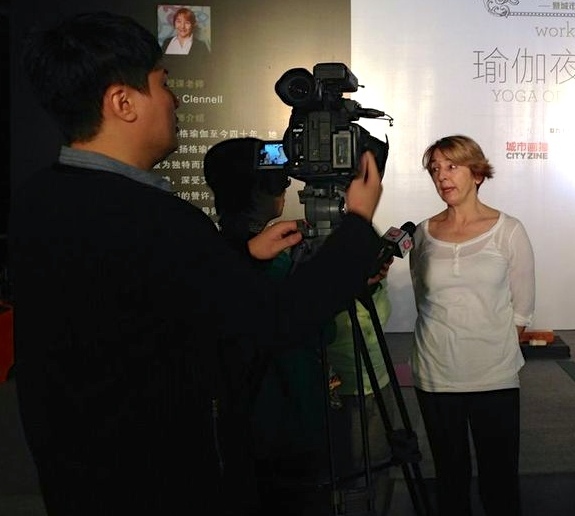 Some of the interviewers wanted to know what I thought about Chinese women only practicing yoga to stay thin. Supta Padangustasana II (Reclining Big Toe Pose to the Side). As you take the right leg to the side, keep the opposite hip from following it. 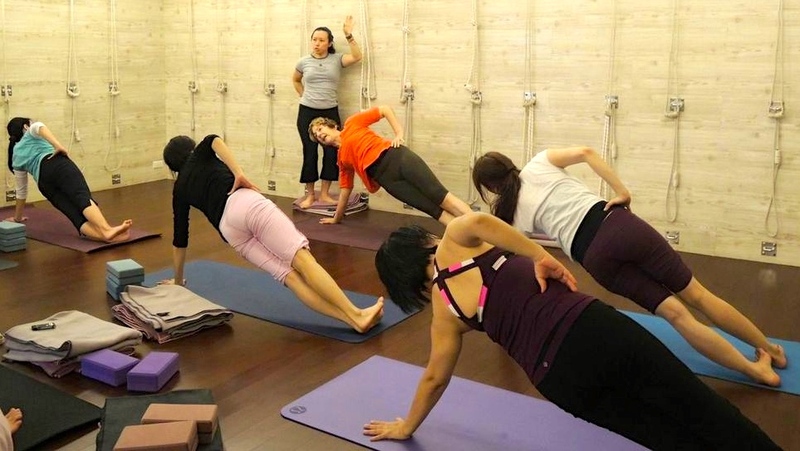 Align the hip bones so they are level with each other; then focus on hip joint mobility, rather than how close to the floor you can get the right leg. 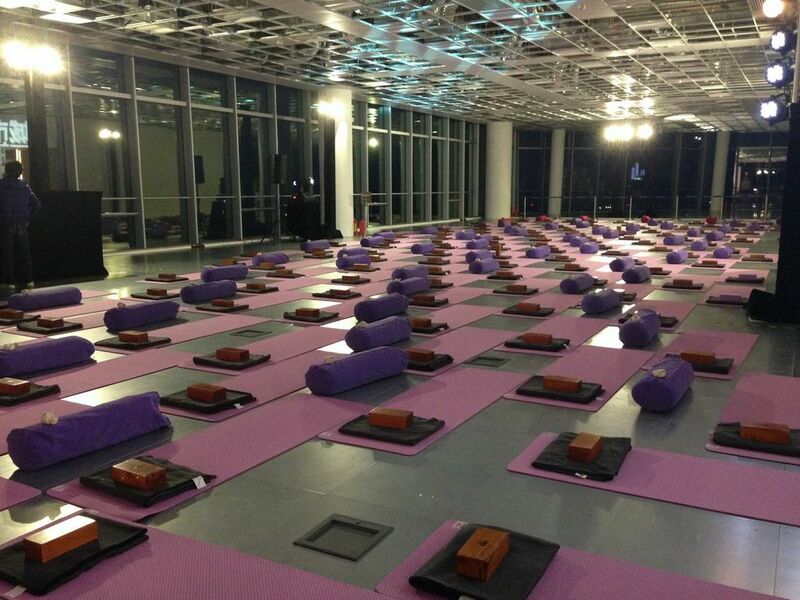 Day one of my 3–day women’s workshop. Photograph © Sophie Chou. Virabhadrasana I (Warrior Pose I) has a lot to teach us about how to hold the lumbar spine in our backbend practice. A block strapped to this region provides a tactile reminder to not drop the lumbar spine forward into the abdomen. Photograph © Sophie Chou. 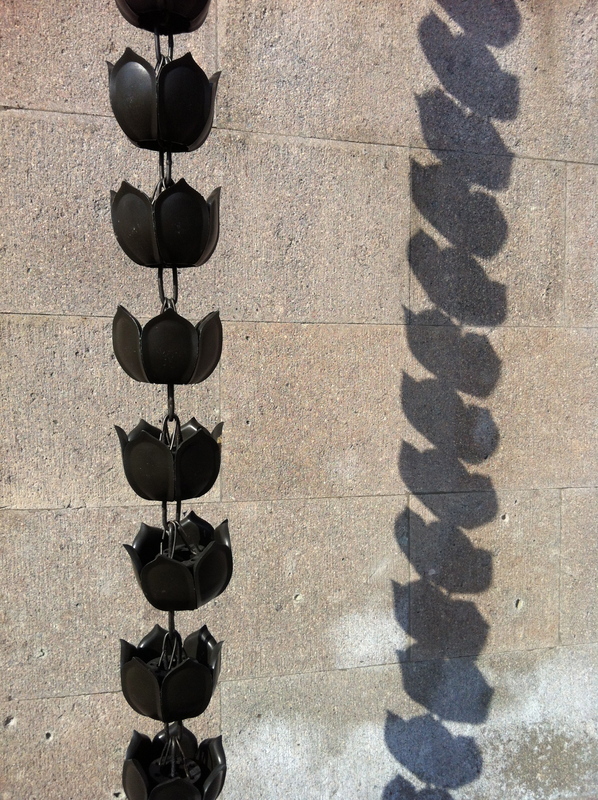 Metal lotus flower rain-chain created by a Japanese artist especially for the Lingyin temple (Temple of the Soul’s Retreat). 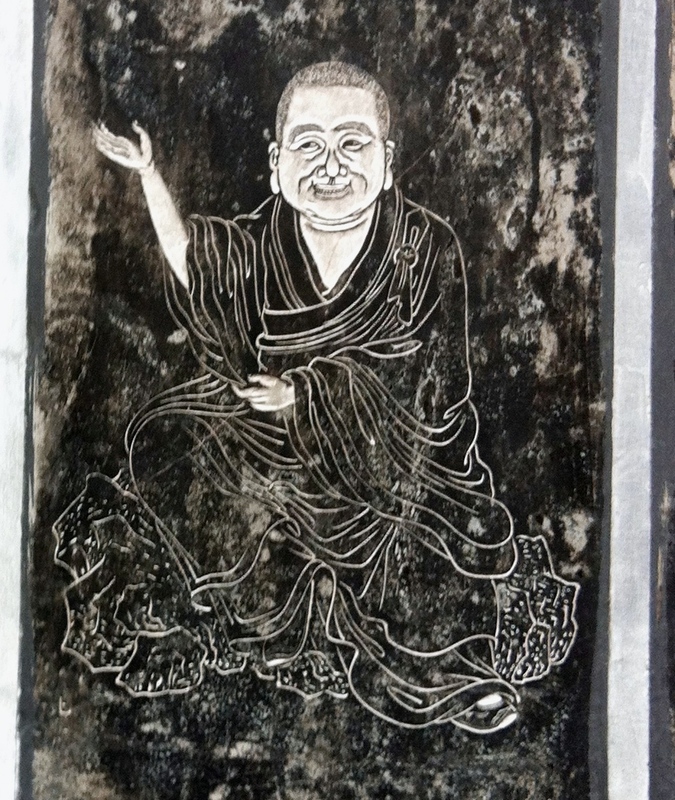 Hidden away beyond the back of the Lingyin Temple were lots of these old images fixed to the side of the buildings where the monks live. 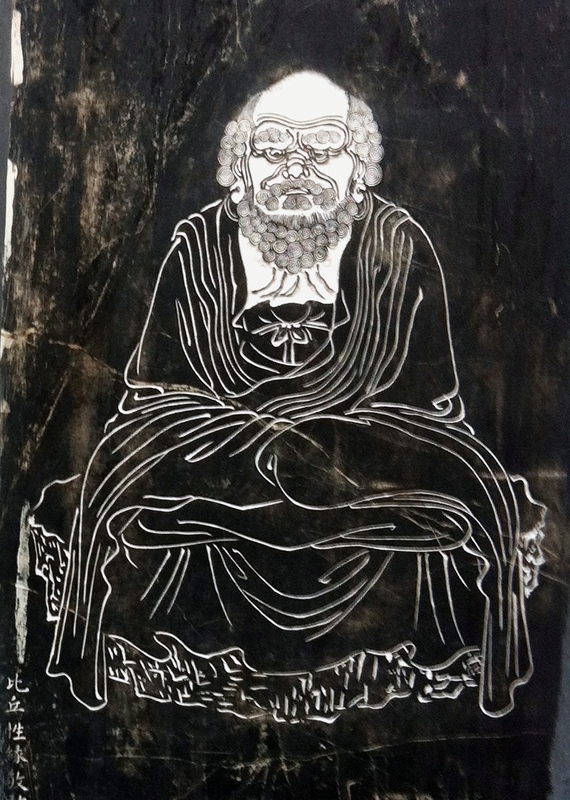 Another of these beautiful etchings. 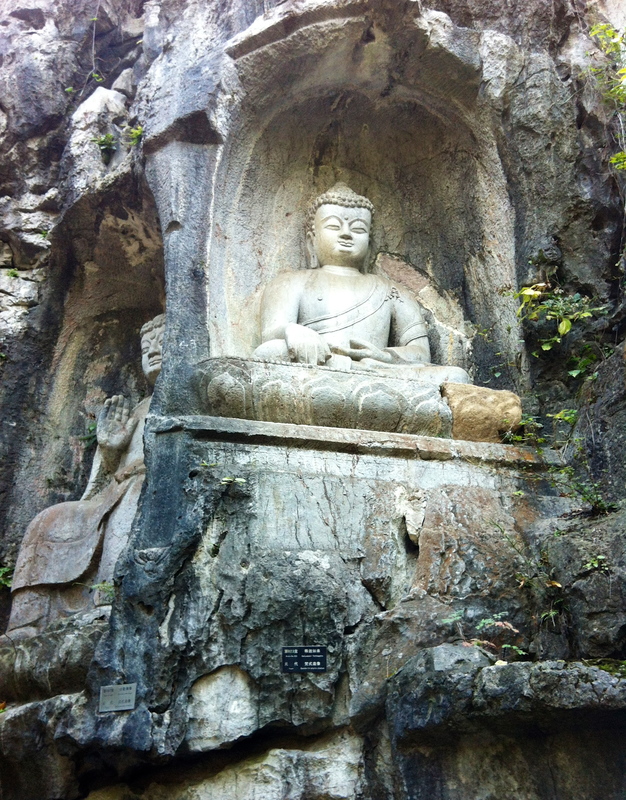 A stone Buddha carved high up into the rocks.